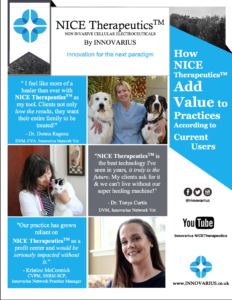 What are NICE Therapeutics and SanaWave? 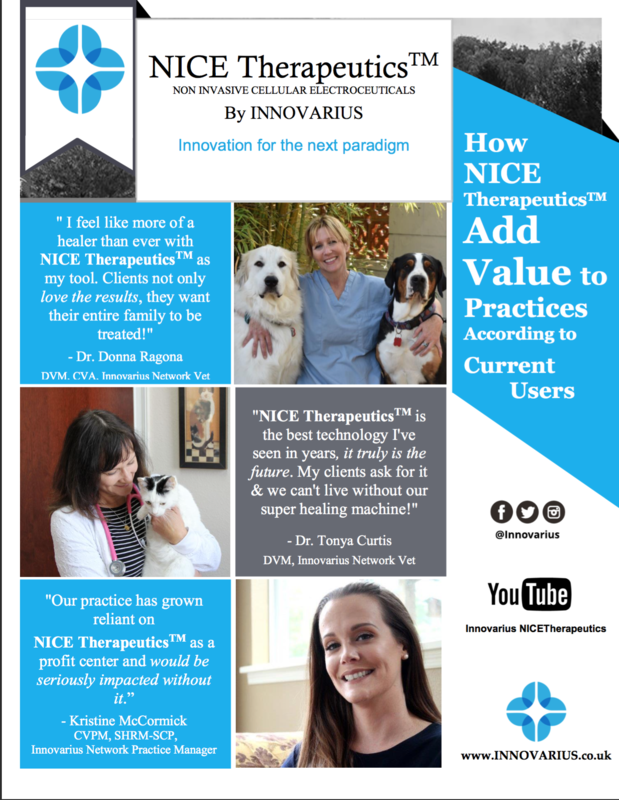 NICE Therapeutics™ SanaWave apparatus Uses Modulated Radio Frequency energy to stimulate a local regional area of hyperthermia (warming heat) in order to rapidly accelerate healing in multiple disease conditions. It is well know that hyperthermia causes vasodilation which brings in more blood flow, oxygen, plasma rich proteins, and other tissue repair molecules into the area energized. There is a net "Washing Out Effect" of cellular mediators of inflammation under the area treated which gets to the causes of pain, increases range of motion and accelerates wound healing . Sanawave has been used to treat Equine, Bovine, Porcine, Ovine, Caprine, Canine, Feline, Avian, Lagomorphs and others. 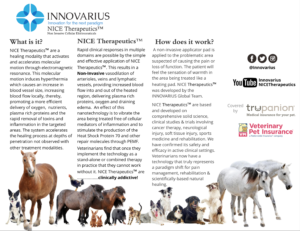 SanaWave NICE Therapeutics™ have been included in animal patient therapy protocols in Intervertebral Disk Disease (IVDD), General Rehabilitation and Oncology with impressive results in many species with great results. How long is a session? How many sessions are needed? Average sessions are 15-30 min per area treated but may be treated up to an hour per site depending on the condition being treated . In a clinical setting 1-6 treatments per area are usually done once per week to effect and then may be repeated as needed for the condition being treated. Results vary with the condition and the degree of chronicity or other mitigating factors, results for many conditions are long standing but certain conditions may require ongoing maintenance. What does a SanaWave procedure feel like? Typically a gentle warming sensation is all that is felt by most patients. In most cases animals just seem to really enjoy it. Side effects may be increased urination and minor drowsiness from increased diuresis and endorphin release. patients are encouraged to drink plenty of water before and after a therapy session. When can normal activities resume after treatment? How long after treatment? Most patients may return to normal activity after a session but rest is encouraged. Many of the results are felt immediately after reaching target temperature with some neurological results lagging by as much as one-two weeks later. How is it different to a TENS machine? A TENS unit sends an electrical current across two superficial electrodes. The SanaWave unit uses a forward facing applicator to send radio frequency energy into the body. 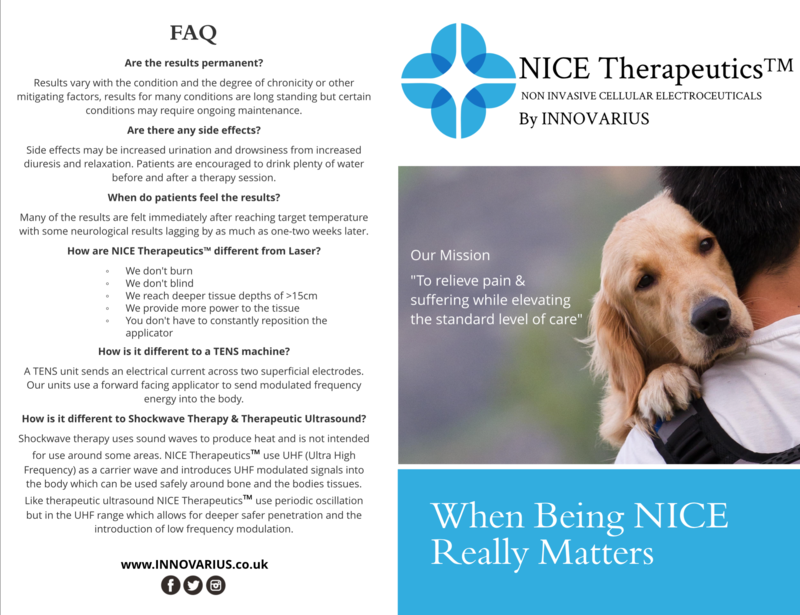 How is it different to Shockwave Therapy? Shockwave therapy uses sound waves to produce heat and must be used with caution around some bony areas. Sanawave uses Ultra High Frequency (UHF) Radio energy as a carrier wave that introduces modulated radio frequency energy into the body. This UHF energy can be used safely around bones, nerves and the bodies tissues in general. Like therapeutic ultrasound SanaWave uses periodic oscillations but in the UHF frequency range which allows for deeper, safer penetration and the introduction of modulated radio frequency energy for treatment of various disease states. How is it different to therapeutic ultrasound? Therapeutic ultrasound therapy uses sound waves to produce heat and is not intended for use around some bony areas. Sanawave uses a UHF radio frequency as a carrier wave and introduces modulated radio frequency signals into the body which can be used safely around bones, nerves and the bodies tissues. Sanawave has an impressive depth of penetration in various tissues and body cavities. Sanawave has been used in the treatment of solid tumors in local regional oncological immunotherapy and hyperthermia. 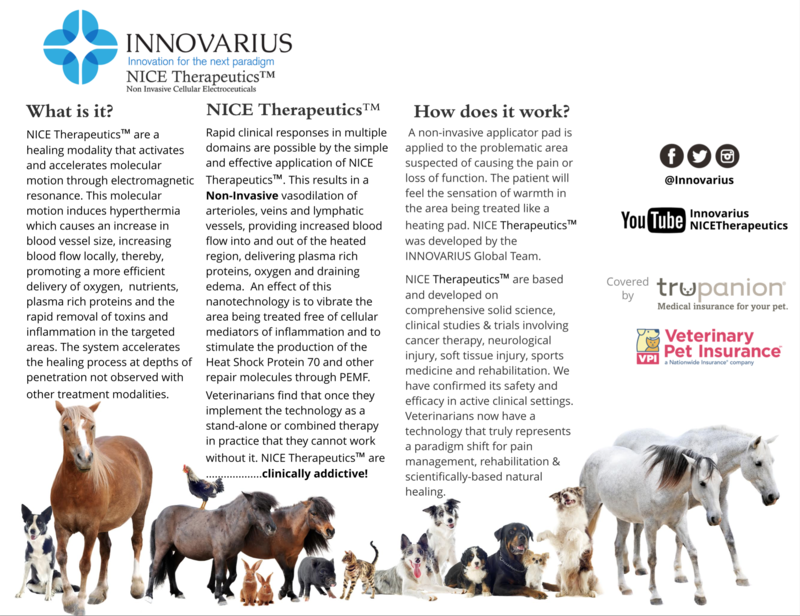 Sanawave is a local regional stimulator of Heat Shock Protein 70 (Hsp70) used in the treatment of IVDD Intervertebral disk disease and works as an electronic anti-inflammatory in various neurologic conditions. Yes. UHF Radio Frequency energy has been used in medicine for over 50 years, our new forward facing applicator platform allows for more clinical applications with lower power demands for improved clinical results. How is it different to a microwave oven? A microwave oven uses lots more power about 800-2000 watts in the 2.5 GHz frequency band and is intended to cook food. SanaWave uses modulated UHF radio energy not microwaves and uses less power to achieve safe clinical results. 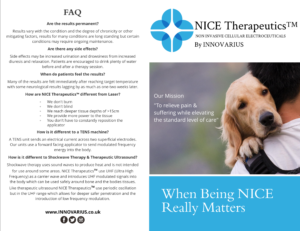 It is intended to gently warm biological tissues and the apparatus's temperature is monitored and controlled with sensors in order to safely and accurately maintain a target therapeutic temperature in real time over a desired body part without the need to move the applicator around like in some laser therapies. The purpose of SanaWave is to gently warm and not to cook tissue at mildly elevated body temperatures for a desired physiological effect.